Through Jazzaddict, our passion for dance is shared with thousands of students internationally. Jazzaddict provides each student with solid technical training, performance training, and the platform to create, achieve and grow as a dancer and artist. Jazzaddict is an examination based syllabus, it is compulsory for all registered studios to enter students for examinations or assessments annually. Please note: choreography is prohibited for use in open classes. This website provides information relevant to examination procedures, responsibilities of teachers and obligations of the Asia Pacific Dance Association. We are commited to providing fast and personal service to all our registered teachers. The levels are made up of a series of exercises including arm combinations, classical technique, floor work, turns, isolations, leaps, amalgamations and dances. There is opportunity for the teacher to stylise many of the exercises with their own head and arm-lines. The teacher notes advise where this is possible. All work is progressive and designed to develop co-ordination, strength, agility and style. Amalgamations include jazz, lyrical or contemporary and musical theatre. These styles complement competition/eisteddfod requirements. The teacher sets the dance and must incorporate compulsory steps. Students can enter the syllabus at any age (and ability) at a level recommended by the teacher. Please see age guidelines above. Candidates sitting Advanced Jazz Two onwards must have sat and passed the previous grade as a prerequisite (ie. Advanced Jazz One). It is compulsory for registered teachers to enter their students for examinations. Lessons in terms one and two of the school year are focused on preparing students for examinations. Examinations are held in the second or third term of the school year (June/July/August/September) in Australia and New Zealand. Examinations are held in June and July in Hong Kong, Macau and China. 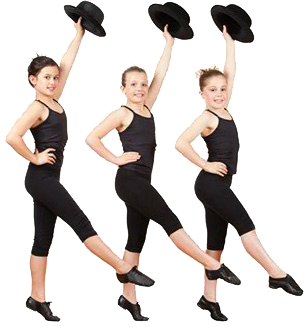 Any student who has had dance experience should be assessed and placed in a class at the recommendation of the teacher. Teachers are able to set their own music with the exception of the musical theatre amalgamations (which are set to timeless Broadway classics). Recommended BPM (beats per minute) for each exercise are provided in the teaching notes. Studios are responsible for their own music licenses for classes. There are optional jazz, lyrical and musical theatre amalgamations available. These provide variety for teachers who may have taught the work for several years. The music for Musical Theatre is set. Students are encouraged to mime or sing the lyrics to encourage expression and performance style. Props are used in many of the Musical Theatre Amalgamations and each level provides an amalgamation suitable for males. Preschool Jazz: "The Ugly Bug Ball" from "Summer Magic"
Primary Jazz One: "Hakuna Matata" from "The Lion King"
Primary Jazz Two: "It's the Hard Knock Life" from "Annie"
Junior Jazz One: (A) "A Spoonful of Sugar" from "Mary Poppins"
Junior Jazz One: (B) "Consider Yourself" from "Oliver"
Junior Jazz Two: "Little People" from "Les Miserables"
Junior Jazz Three: "Toot Sweets" from "Chitty Chitty Bang Bang"
Elementary Jazz One: (A) "One" from "Chorus Line"
Elementary Jazz One: (B) "If My Friends Could See Me Now" from "Sweet Charity"
Elementary Jazz Two: "Razzle Dazzle" from "Chicago"
Elementary Jazz Three: "Diamonds are a Girl's Best Friend" from "Moulin Rouge"
Intermediate Jazz One: "Big Spender" from "Sweet Charity"
Intermediate Jazz Two: "You Gotta Get a Gimmick" from "Gypsy"
Intermediate Jazz Three: "America" from "West Side Story"
Advanced Jazz One: "I Hope I Get It" from "A Chorus Line"
Advanced Jazz Two: "I Just Can't Do It Alone" from "Chicago"
Impromptu work is included to encourage freedom of movement in junior levels. The Examiner provides the music for the Impromptu. Students should prepare for impromptu work seeking to show musicality, use of the floor, use of levels and variety of steps. Student choreography is incorporated at the higher levels to develop student initiative and creativity. Students choreograph their work individually with assistance from the teacher where necessary. Time limits are detailed in the teaching notes. The teacher provides the music for student choreography (the same music must be used by all the students in an examination group/grade - ie. no individual music as student choreography is usually seen in pairs). Solo Seal is the final examination of the syllabus in whcih the dancer showcases their training and choreography in a final performance examination. An audition amalgamation is set by the examiner and taught to the candidate/s at the beginning of the examination (the dancer to wear appropriate class/audition dancewear). Candidates then have three self-chroeographed dances to perform, each with a change of costume. Solo Seal candidates are expected to arrange their own choreography, costumes, props (if required), music (choice and edit), which is overseen by the teacher. As this is the pinnacle performance examination which completes all syllabus training, candidates are permitted to invite an audience to view the performance pieces if they wish. Filming by the audience is permitted if agreed by the candidate and teacher.